Council Directive 93/31/EEC of 14 June 1993 on stands for two-wheel motor vehicles (3) has been substantially amended (4). In the interests of clarity and rationality the said Directive should be codified. Directive 93/31/EEC is one of the separate Directives of the EC type-approval system provided for in Council Directive 92/61/EEC of 30 June 1992 relating to the type-approval of two or three-wheel motor vehicles as replaced by Directive 2002/24/EC of the European Parliament and of the Council of 18 March 2002 relating to the type-approval of two or three-wheel motor vehicles (5) and lays down technical prescriptions concerning the design and construction of two-wheel motor vehicles as regards their stands. These technical prescriptions concern the approximation of the laws of the Member States to allow for the EC type-approval procedure provided for in Directive 2002/24/EC to be applied in respect of each type of vehicle. Consequently the provisions laid down in Directive 2002/24/EC relating to vehicle systems, components and separate technical units apply to this Directive. Since the objective of this Directive, namely the granting of EC component type-approval in respect of the stand for a type of two-wheel motor vehicle, cannot be sufficiently achieved by the Member States and can therefore, by reason of the scale and effects of the action, be better achieved at Community level, the Community may adopt measures, in accordance with the principle of subsidiarity as set out in Article 5 of the Treaty. In accordance with the principle of proportionality, as set out in that Article, this Directive does not go beyond what is necessary in order to achieve that objective. This Directive shall apply to stands for all types of two-wheel motor vehicles as referred to in Article 1 of Directive 2002/24/EC. 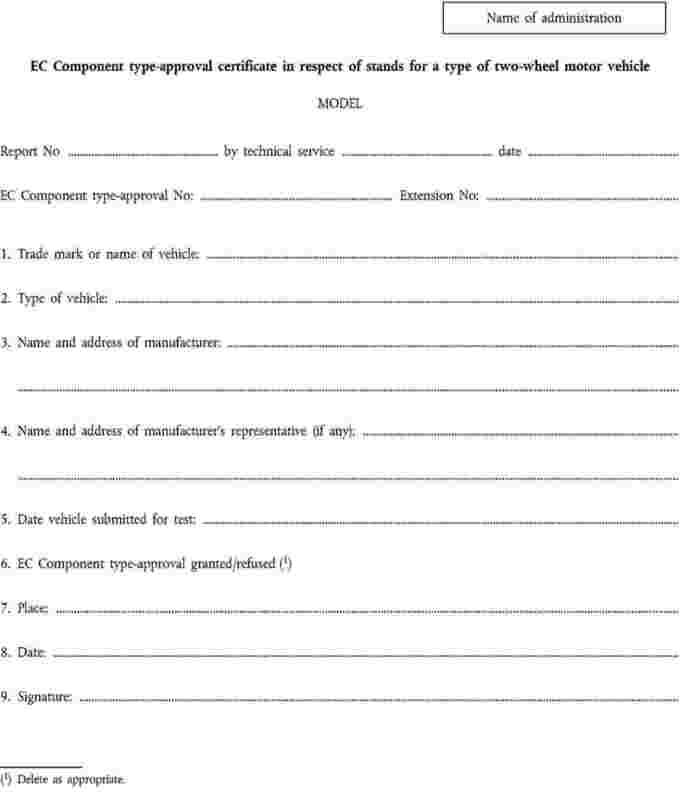 The procedure for the granting of EC component type-approval in respect of the stand for a type of two-wheel motor vehicle and the conditions governing the free movement of such vehicles shall be as laid down in Chapters II and III of Directive 2002/24/EC. if the stands of those vehicles comply with the requirements of this Directive. 2. Member States shall refuse to grant EC type-approval for any new type of two-wheel motor vehicle on grounds relating to stands if the requirements of this Directive are not fulfilled. Directive 93/31/EEC, as amended by the Directive listed in Annex II, Part A, is repealed, without prejudice to the obligations of the Member States relating to the time-limits for transposition into national law and application of the Directives set out in Annex II, Part B. (1) OJ C 234, 30.9.2003, p. 20. (2) Opinion of the European Parliament of 25 September 2007 (OJ C 219 E, 28.8.2008, p. 66) and Council Decision of 7 July 2009. (3) OJ L 188, 29.7.1993, p. 19. ‘median longitudinal plane of the vehicle’ means the longitudinal plane of symmetry of the rear wheel of the vehicle. All two-wheel vehicles shall be fitted with at least one stand in order to keep them steady when stationary (e.g. when parked) but not held in a static position by a person or external means. Twin-wheel vehicles need not be fitted with stands but must meet the requirements set out in point 6.2.2 when in a parking position (parking brake applied). The stand must be of either a prop or a centre type, or both. Where the stand swivels about the lower part of or below the vehicle the outer edge(s) of that stand must swing to the rear of the vehicle in order to attain the closed or travelling position. the vehicle being left unattended in its parking position. The requirements set out in point 3.1.1.3 do not apply if the vehicle is designed in such a way that it cannot be propelled by its engine when the prop stand is extended. when the vehicle moves forward in such a way as to raise the centre stand from the supporting surface. The requirements set out in point 3.2.1.2 do not apply if the vehicle is designed in such a way that it cannot be propelled by its engine when the centre stand is extended. Moreover, vehicles may be fitted with a tell-tale that is clearly visible to the rider when seated in the driving position and which, when the ignition is switched on, lights up and remains so until the stand is in its retracted or travelling position. 5.1. The following tests must be carried out in order to determine the capacity for holding the vehicle in a stable condition as specified in points 3 and 4. The vehicle must be submitted at its kerb mass. The tyres must be inflated to a pressure recommended by their manufacturer for that state. The transmission must be in neutral or, in the case of an automatic transmission, in the ‘parking’ position where such exists. If the vehicle is fitted with a parking brake, it must be applied. The steering shall be locked in position. If the steering is able to be locked when it is turned to either the left or the right the tests must be carried out in both positions. A flat, horizontal pad having a hard surface that is dry and free from grains of sand may be used for the tests referred to in point 6.1. A parking platform must be used for the tests referred to in point 6.2. The parking platform must have a rigid, flat, rectangular surface which is able to support the vehicle without perceptible flexing. The surface of the parking platform must possess sufficient anti-skid properties to prevent the vehicle from sliding across the supporting surface during the tilt or lean tests. 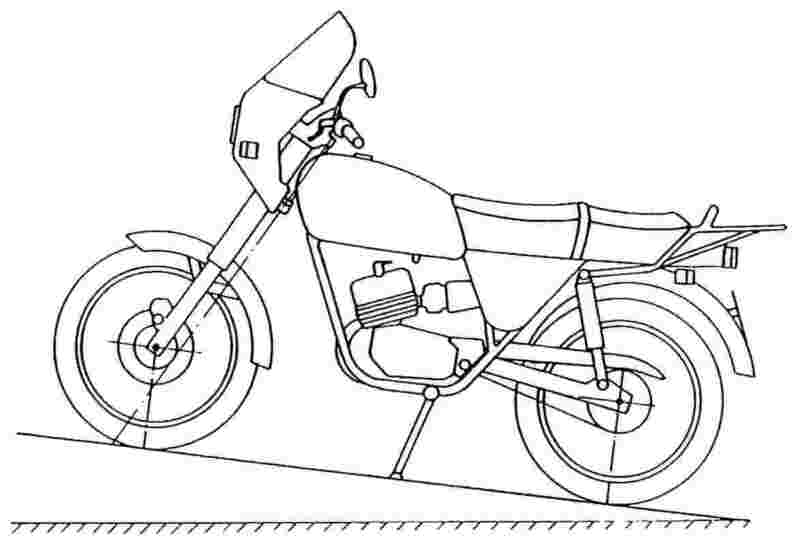 The parking platform shall be designed in such a way as to be able to assume at least the transverse tilt (tt) and the longitudinal tilt (lt) required by point 6.2.2. With the vehicle on the test pad the prop stand is extended or moved into the parking position and the vehicle is brought to rest upon it. 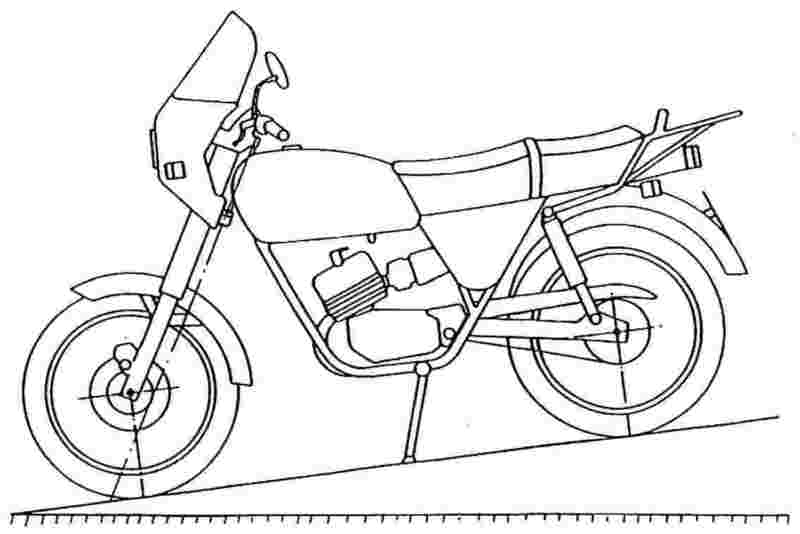 The vehicle is moved in order to increase by three degrees the angle formed by the median longitudinal plane and the supporting surface (by moving the vehicle towards the vertical). This movement must not cause the prop stand to return automatically to its retracted or travelling position. The vehicle is placed on the parking platform with the prop stand and, separately, the centre stand in the extended or parking position and the vehicle is allowed to rest on the stand. See figures 1a, 1b and 2. 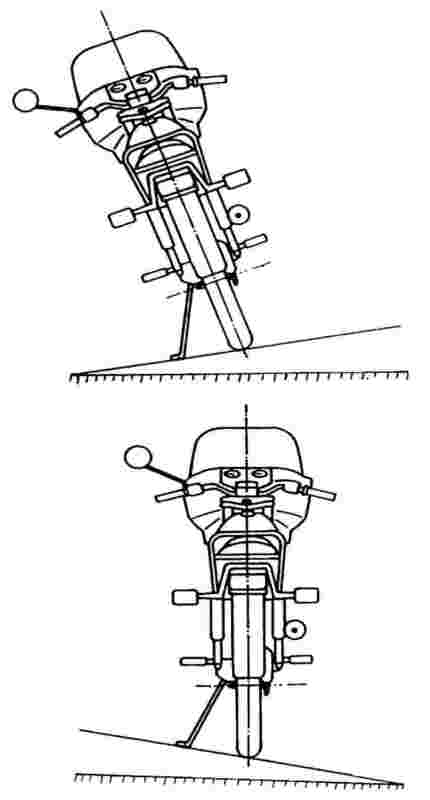 Where a vehicle on a tilted parking platform rests on the centre stand and just one wheel and may be maintained in that position with the centre stand and either the front or the rear wheel in contact with the supporting surface, the tests described above must be conducted solely with the vehicle resting on the centre stand and rear wheel provided that the other requirements set out in this point are met. The vehicle must remain stable when the parking platform is tilted by each of the required amounts and the above requirements have duly been met. Alternatively the parking platform may be tilted by the required amounts before the vehicle is moved into position. (OJ L 188, 29.7.1993, p. 19). (OJ L 300, 29.11.2000, p. 18). ‘From the date mentioned in the first subparagraph Member States may not, for reasons connected with the stands, prohibit the initial entry into service of vehicles which conform to this Directive’. The said date is 14 December 1994; see the first subparagraph of Article 4(1) of Directive 93/31/EEC. if the stands of those vehicles comply with the requirements of Directive 93/31/EEC, as amended by this Directive. 2. With effect from 1 July 2002, Member States shall refuse to grant EC type-approval for any new type of two-wheel motor vehicle on grounds relating to stands if the requirements of Directive 93/31/EEC, as amended by this Directive, are not fulfilled.’.